A harmless joke, a substantial misunderstanding, or a sacrilegious quasi-caricature of the one true God? The Flying Spaghetti Monster, a satire on intelligent design and creation, reveals more than irreverence. 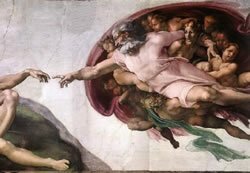 The image is familiar: on the left, the reclining Adam, arm extended casually toward a bearded, robed figure on the right surrounded by an angelic host: Michaelangelo’s The Creation of Adam, a fresco on the ceiling of the Sistine Chapel. The Flying Spaghetti Monster creates Adam. 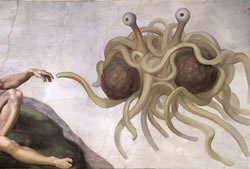 Recently, however, this famous image has been showing up (around the web and elsewhere) with God replaced by the “Flying Spaghetti Monster,” the creator deity of a parody religion (the Church of the Flying Spaghetti Monster). The Flying Spaghetti Monster is (allegedly) exactly what it sounds like: a large, hovering mass of spaghetti with meatballs and eyeballs that, according to this church, created the universe. The religion also has its own gospel, the 192-page-long Gospel of the Flying Spaghetti Monster, along with a modicum of satire doctrine (including ideas of heaven and hell and worship practices). Some find that hard to believe, so it may be helpful to tell you a little more about our beliefs. We have evidence that a Flying Spaghetti Monster created the universe. None of us, of course, were around to see it, but we have written accounts of it. We have several lengthy volumes explaining all details of His power. Also, you may be surprised to hear that there are over 10 million of us, and growing. Ironically enough, the “members” of the church of the Flying Spaghetti Monster (known as “Pastafarians”), in addition to mocking God himself, are lampooning the Intelligent Design Movement for not identifying a specific deity—that is, leaving open the possibility that a spaghetti monster could be the intelligent designer. Yet much of the motivation behind the Intelligent Design Movement is that by not identifying a creator (or creators), the movement remains free of specific religious content and (so the argument goes) does not violate the First Amendment. Thus, the satire is possible because the Intelligent Design Movement hasn’t affiliated with a particular religion, exactly the opposite of what its other critics claim! This puts the Intelligent Design Movement in a double bind of sorts: if they name a designer, they are accused of being merely a religious theory; if they name no designer, their opponents lambaste their ideas for theoretically allowing pasta monsters as deities. Investigator: Just look at this contraption, Datson: miles of wiring and acres of circuitry, programming manuals strewn about the floor—it’s obvious that someone is building a large computer. But whom, and why? Sidekick: How can you possibly determine that this computer was built by someone without knowing who the builder actually was? Based on what you suppose from this scene, could it not have been a large Caesar salad that designed this device? Quite obviously, the sidekick’s reasoning skills are wanting: one can establish that certain designs require (or, at least, strongly suggest) a designer without knowing the identity of that designer. The key point of the Intelligent Design Movement has been to bring light to the many signs of design in life—signs that point to a designer—without making attempts to establish who (or what) that designer (or designers) is (or was). Design, yes, but how do we know the Designer? Friend of computer scientist: Sirs, I appreciate your analysis of this laboratory, but I believe you are both overlooking something rather important. Here is the complete instruction manual written by the computer’s creator—a manual that describes why, how, and when the computer was designed and built! The manual accurately describes everything you see in front of you and more! The computer’s creator has merely gone out to buy more parts at the moment. In other words, young-earth creationists view the evidence in light of God’s revelation to us; in reality, Darwinists and intelligent design advocates also view the evidence through their own unproven presuppositions about the way the world works. A Sacrilegious Quasi-caricature of the One True God? To understand not only creation, but also sin, death, and salvation, people need the special revelation of the Bible. Although our comments up to this point have been in defense of the Intelligent Design Movement, we recognize that the source of the Flying Spaghetti Monster satire is that the Intelligent Design Movement does not identify a designer due to its bottom-up, evidence-oriented look at biology. This appeal is supposed to insulate intelligent design from religious status, allowing it to be presented in public schools (though this strategy has been judicially stymied so far). Intelligent design leaves unclear not only who the designer is, but also why we are here at all. To understand not only creation, but also sin, death, and salvation, people need the special revelation of the Bible—not just the general revelation around us that implies a designer. We know who God is because He told us in His Word, revealing not only that He created us, but also revealing elements of His nature. Be sure to read more on this topic at The Intelligent Design Movement. Furthermore, atheists, agnostics, and evolutionists (pardon the overlap) carry their own unanswered questions, such as: Where did the universe come from? How could life originate from abiotic chemicals? What explains the earth’s privileged location in the galaxy? We are not worried that Flying Spaghetti Monsterism is going to lure away Christians; rather, the religion’s obvious primary purpose is sardonic humor. Nevertheless, it reflects a growing attitude of mockery toward not just organized religion, but also toward any suggestion that there is something—or Someone—“out there,” beyond ourselves and our fallen notions.